I was able to procure the last batch of titanium sold at the now defunct Boeing Surplus store for Theodore Grey, (creator of the Periodic Table Table, and one who has talked to me at length via email about this project). This incredibly historic titanium unfortunately looked really bland in its original sheet metal form. 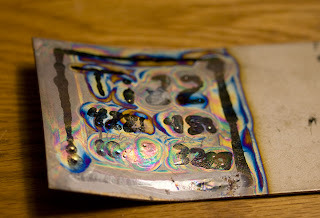 After talking to him at some length about how to best identify titanium (see his January 2008 column here) I decided to spruce up one of the samples with my friend’s TIG welder. I really like how it discolors! Thank God he had an auto darkening helmet! I don’t think I could have written as well as I did otherwise. I had a couple of pieces left over after this, so we decided to make an abstract sculpture. This was the first time I welded this metal, and used this session to just get a better feel for it. 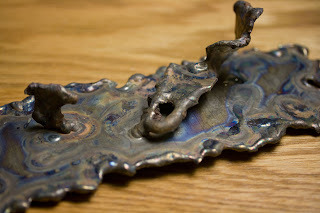 Since there was no titanium welding rod in his shop, I just had fun melting pieces into each other. Next entry on Monday July 28th! Neato! This project is like NASA, spawning unexpected benefits like microwave ovens and such.